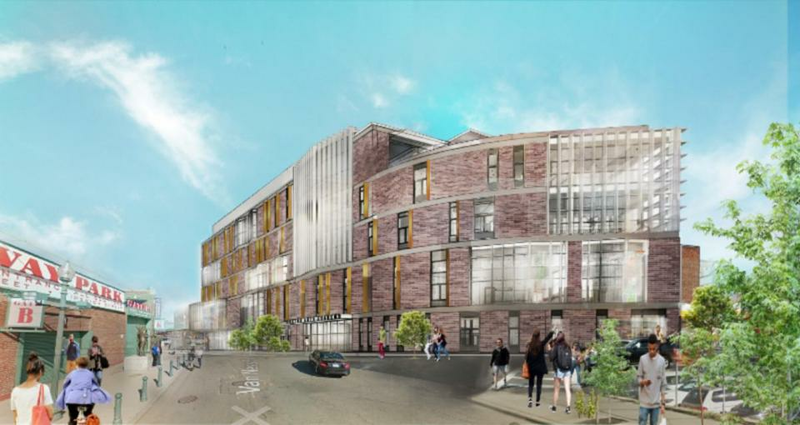 The Massachusetts School Building Authority has unanimously approved a $125 million project — years in the making — to replace the Boston Arts Academy building in the Fenway. The state agency will cover $49 million of the project’s costs, according to a copy of the agency’s recommendation to its board, while the city will pay for the rest of it. Staff, parents, and other supporters have been pushing for a new building for many years — an effort that dates back to the era of former mayor Thomas M. Menino. Initially, the school wanted to relocate to the Theatre District, but real estate and construction costs were too high. Instead, city and school officials, working with the state agency, decided the most cost-effective move was to replace the school’s building, which is located in a former warehouse across the street from Fenway Park. Mayor Martin J. Walsh, who embraced the project as part of his $1 billion effort to overhaul school buildings, turned out for the meeting. The five-story building will feature a 500-seat theater with an orchestra pit, four dance studios, a black box theater, 10 sound-proof instrumental practice rooms, and a gymnasium. Its current building is not well-suited for a visual and performing arts program. It has no theater, support beams run through the middle of dance studios, and rooms are so small that students in art classes are sitting nearly elbow to elbow. The Boston Arts project was one of three items related to the Boston school system that the state board acted on. The board agreed to explore a renovation project for the Carter Development Center, which works with students with significant disabilities in a facility on Northampton Street near Northeastern University. The school has been pushing for years to get a therapeutic swimming pool — equipped with special harnesses, electronic lifts, and ramps — to help students in wheelchairs. The board also approved a three-year extension — slightly more than what school and city officials requested — to perform a feasibility study on a new school building for the Quincy Upper School in Bay Village. The school has been looking for a new site for years — and even at one point teamed up with Boston Arts on one location that fell through. Correction: This story has been updated to correct the size of the theater. James Vaznis can be reached at james.vaznis@globe.com.Follow him on Twitter @globevaznis.